This is our version of the quintessential toe weighted saddle shoe. Wear this necklace 3 different ways by simply taking one component off the chain. 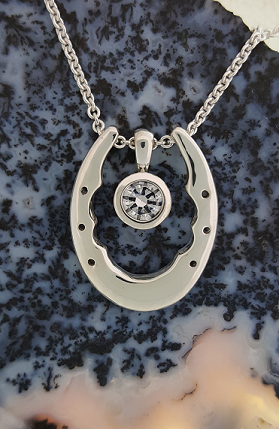 Wear just the horseshoe slide, just the CZ drop, or all together as pictured. A 1.7mm 18” Sterling Silver Cable Chain is included with the set. This set is also available in 14kt yellow gold and 14kt white gold.